The Spirit™ multimedia player/recorder and stereo learning center is teacher-tested to support reading activities, language learning, ESL, foreign language instruction, and ELL/ELD programs associated with the English Language Arts portion of the Common Core State Standards. You'll appreciate the flexibility in a learning center that's equally versatile for music & movement classes or read-alongs in independent study. The 2 Watts of the Spirit are powerful enough for up to 40 people to hear content in a typical room for whole class learning. 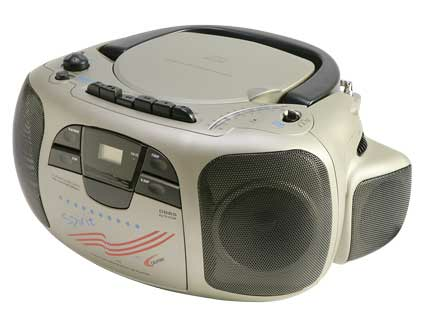 A jackbox can be connected to the 3.5mm headphone plug to use the Spirit as a learning center for a small group of differentiated learners to listen through connected headphones without disrupting the rest of the class. The Spirit is also available in 4 and 6-person Learning Center configurations. Two options include a 10-person jackbox and Switchable Stereo/Mono headphones with either a Tabletop or Rolling Cart ready-to-use Audio Pod. Both pods come with dedicated storage space for six headphones, multimedia player, jackbox, audio materials, books, and a special section to organize cables and cords for neat, classroom organization. 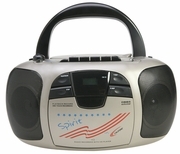 The Spirit is also available with six headphones and the Sound Alert jackbox, which helps prevent student hearing loss by flashing a red light if the audio that's played through it exceeds 85 decibels.